Published by Roy E. Newing, The Boat House, Grove Ferry Road, Upstreet, Canterbury, Kent circa 1972. 1972. 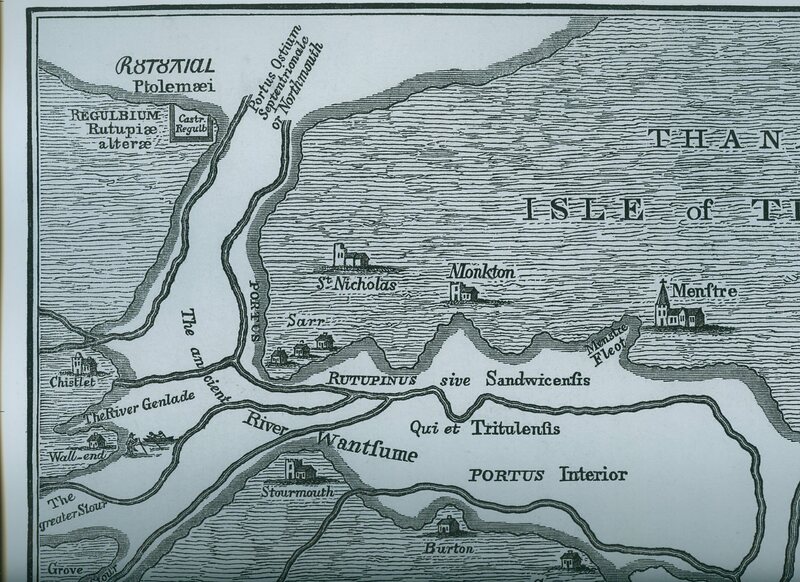 Copied map from circa 1550 on new coated paper measuring 17½'' x 12''. 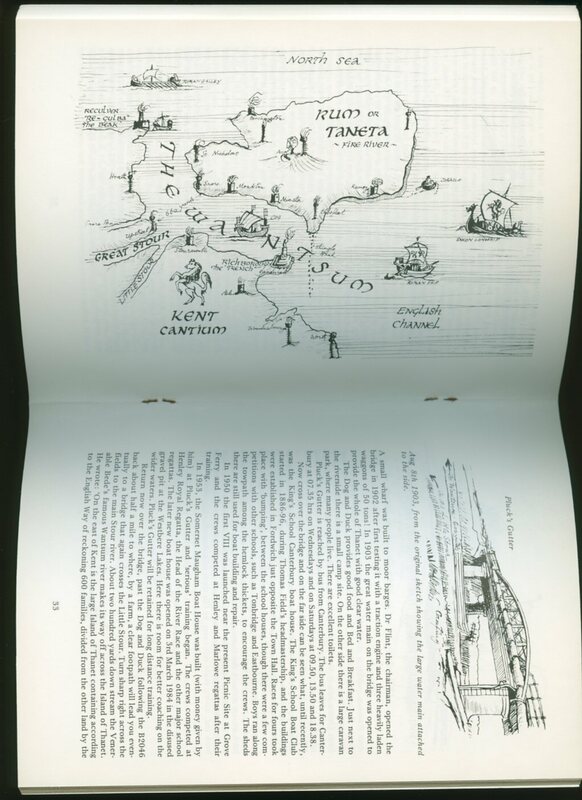 Lewis's history of the Isle of Thanet 'Tenet', published in 1723, and a description of the Ifle of Thanet, printed in London, 1763, give a very different course to the river Rutupia [Richborough] than what now appears. 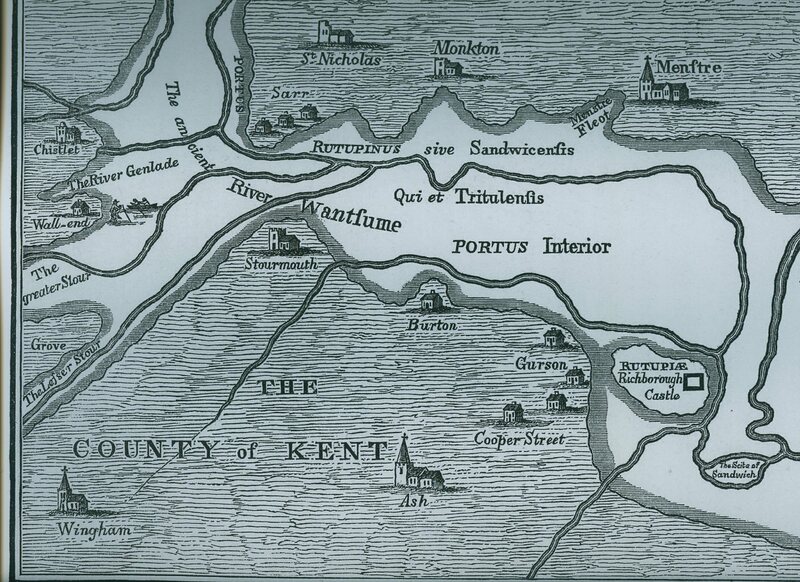 The river Stour begins at Stourmouth, and the water between that junction and Sandwich Haven is called the Wantfume river, and runs by Richborough to Sandwich and the Haven. The plate in Lewis puts the Roman castrum 'castle' on the edge of the water. 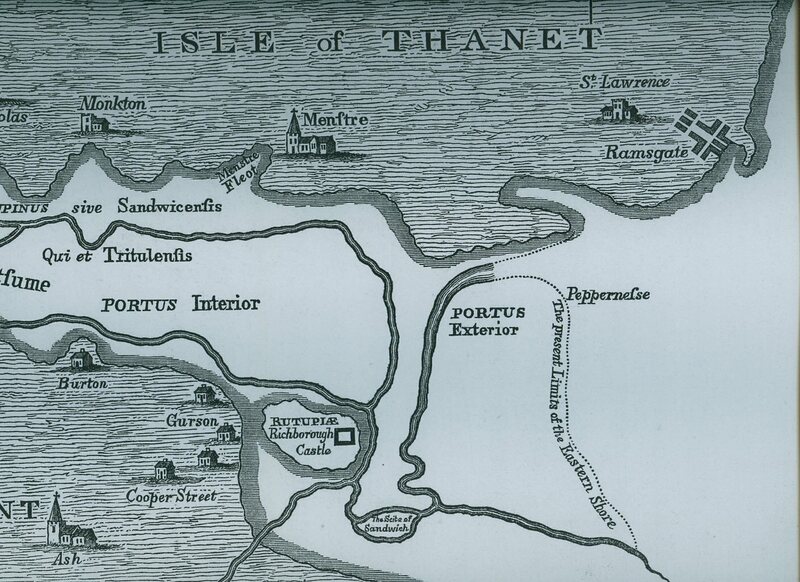 Wherever the Romans made a lodgement on the coast they built a fortification of some kind in immediate connection with their port. Rutupia then, the place of their fort, would be their original port; and it appears that Sandwich, which is some distance from it, had no existence at that period, and did not rise till afterwards. 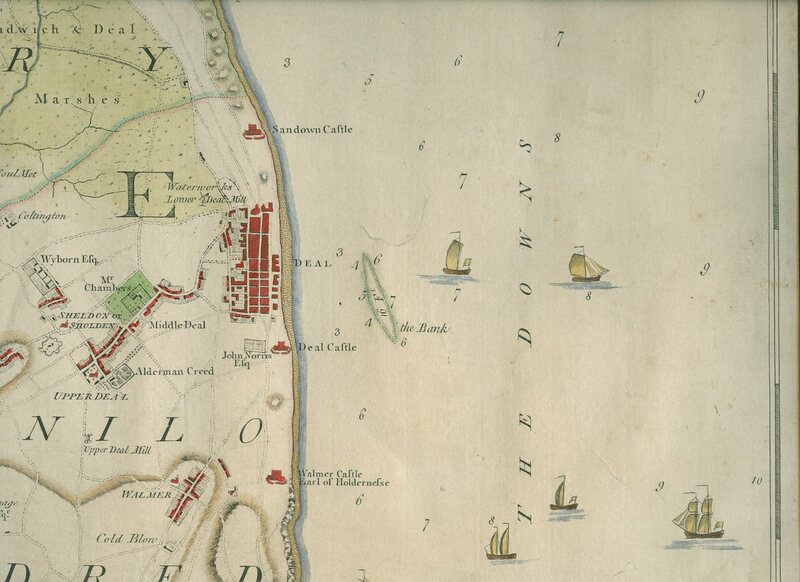 In fact, this map shows that the site of the present town was then covered by the sea. 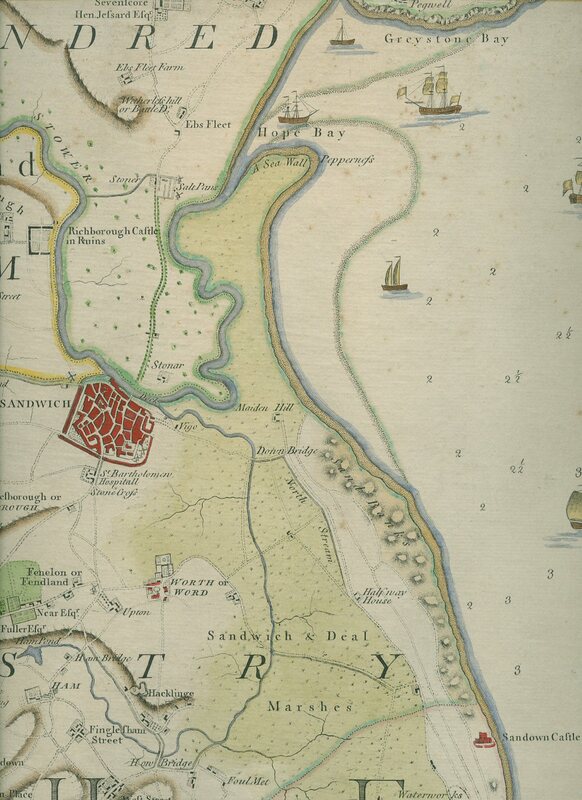 Subsequently the river Wantsume had its course from the Haven by Stonar and Sandwich westward to Stourmouth, and thence northward to the northern coast of the island near Reculver, which was then called the 'North Mouth,' or North Haven. Member of the P.B.F.A. 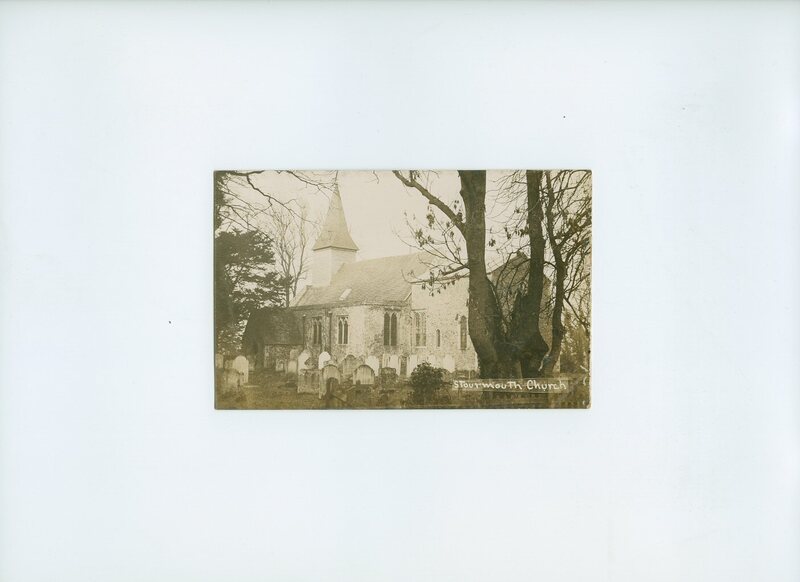 5½'' x 3½'' unused sepia post card with a photograph of the rear of the Church down Church Lane, West Stourmouth. A halfpenny stamp for inland, one-penny foreign to rear. Unused but with small brown mark to the rear. Scarce. Member of the P.B.F.A. Printed by Drury and Andrews, London 1769. 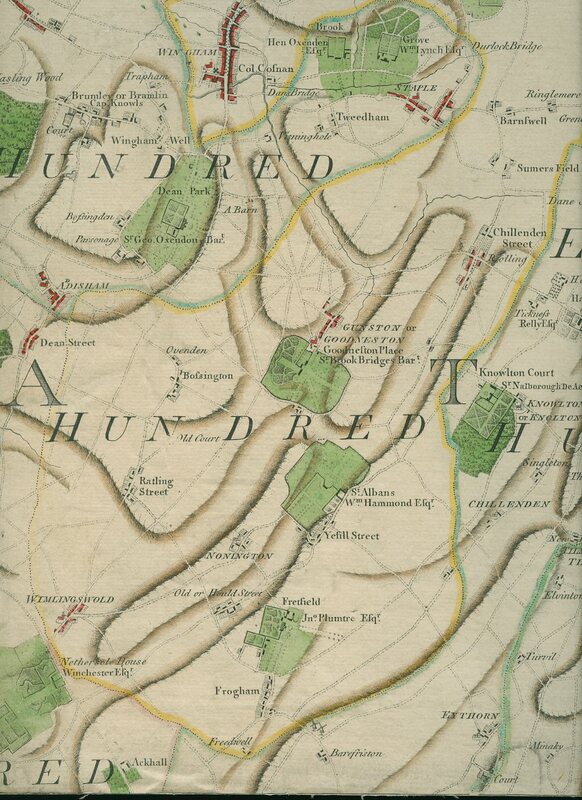 London 1769. Original hand coloured map mounted on linen measuring 27½'' x 18''. Super boats out at sea also showing 'Brake' and 'Crofs Ledge' [Goodwin Sands]. Just a little fraying to the edges, colours sharp and bright, without any creases and in Very Good clean condition. 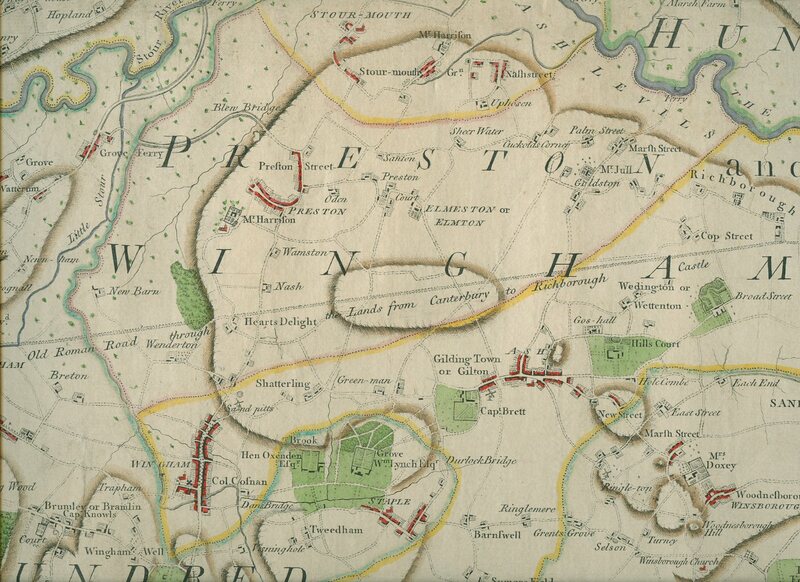 We currently hold in stock 1 other Drury and Andrews map. Member of the P.B.F.A. 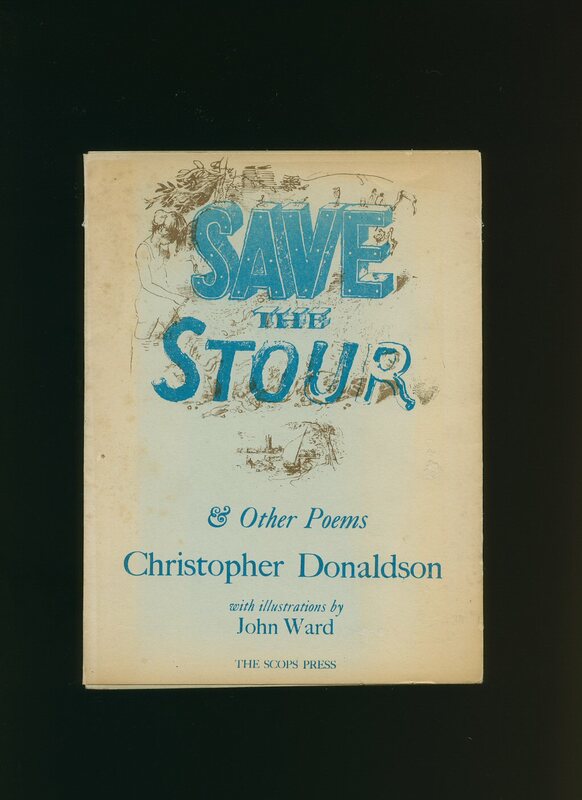 Published by Headley Brothers Ltd., 109 Kingsway, London and Ashford, Kent 1966. 1966. Publisher's original stapled blue card wrap covers [soft back], priced 2/-. 8vo. 8½'' x 5½''. 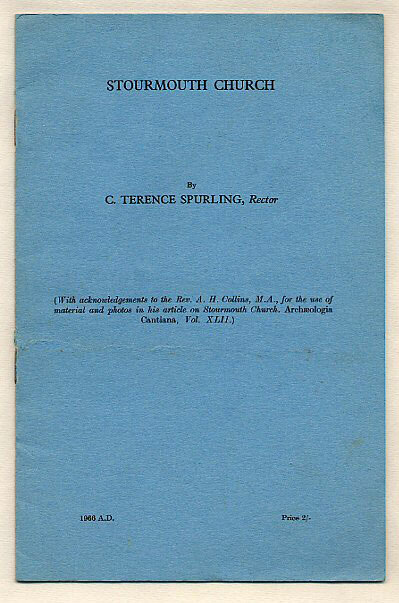 Contains 5 pages of text, plan of the Church, and two full-page monochrome photographs, plus blue covers. In Very Good condition, no dust wrapper as issued. Member of the P.B.F.A. 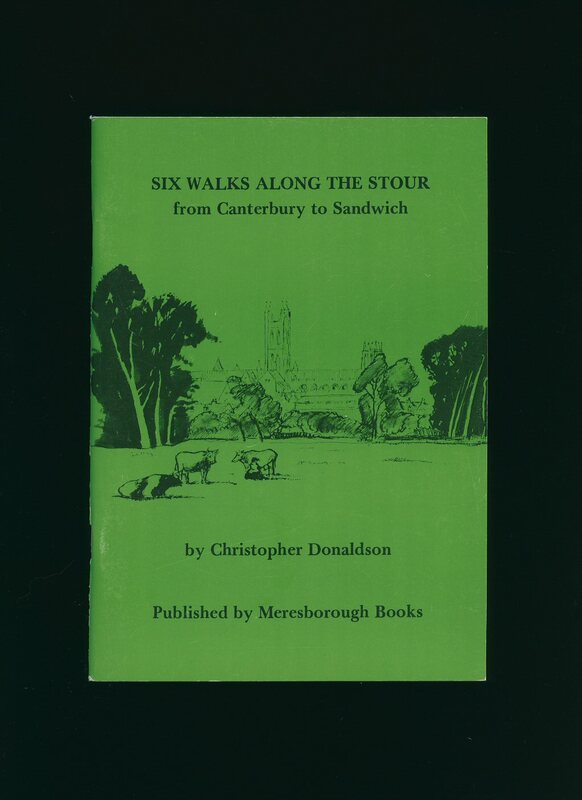 Published by Hodder and Stoughton Ltd., London First Edition 1963. London 1963. First edition hard back binding in publisher's original blue paper covered boards, gilt title and author lettering to the spine. 8vo. 8'' x 5½''. Contains 192 printed pages of text. Small label removed from the foot of the front free end paper, without any ownership markings. Very Good condition book, in near Very Good condition dust wrapper with spine and edge rubbing, small stain to the top rear cover, not price clipped 15s. The Ferry Cottage found in the hamlet of Pluck's Gutter really does exist and is visible from our office window down here in deepest East Kent. The Great Stour meanders into Sandwich, whilst The Little Stour, which borders our property, forks at Pluck's Gutter. Dust wrapper supplied in archive acetate film protection, this protects and prolongs the life of the paper, it does not adhere to the book or to the dust wrapper. Member of the P.B.F.A. 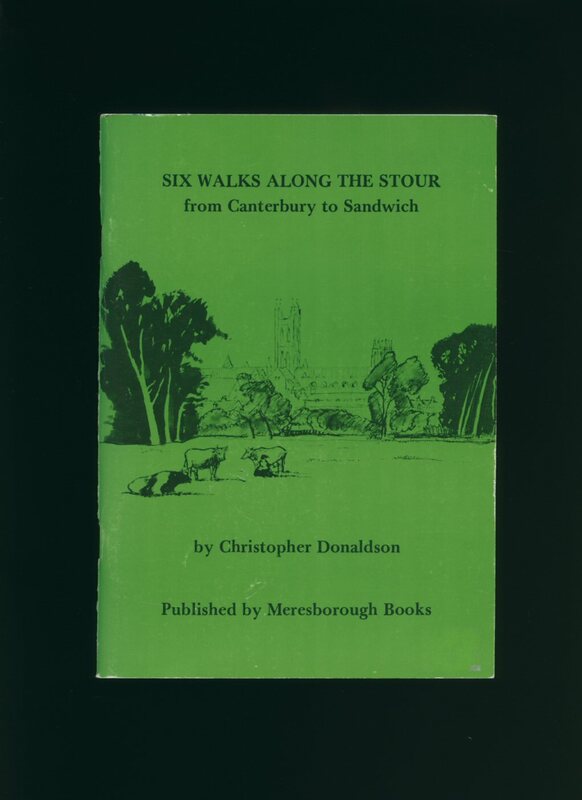 Published by The Scops Press [Robert Jackson] Canterbury First Edition 1974. 1974. 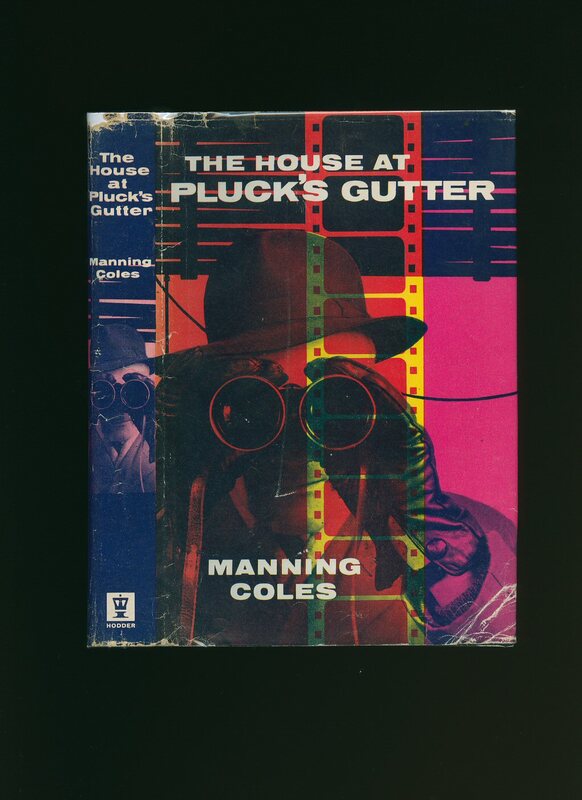 First edition in publisher's original plain grey card wrap covers [softback]. 8vo. 8'' x 6''. Contains 48 printed pages of text with monochrome illustrations throughout. Robert Jackson the 'Scops Press' was a local schoolteacher and an amateur 'Sunday Printer' who lived and worked in the Stour Valley for many years. Fine condition book in Very Good condition dust wrapper which has sun faded and has light foxing to the edges, dent mark to the rear cover. The last leaf has a drawing of a bunch of wild flowers above which are the names of Christopher Donaldson and John Ward, being that they are in the small fountain as the illustrations it is difficult to determine if they are printed or signed names, placed opposite these is a plain sheet of blue paper, the same blue as an unfaded dust wrapper which can be seen by the inner flaps. Member of the P.B.F.A. 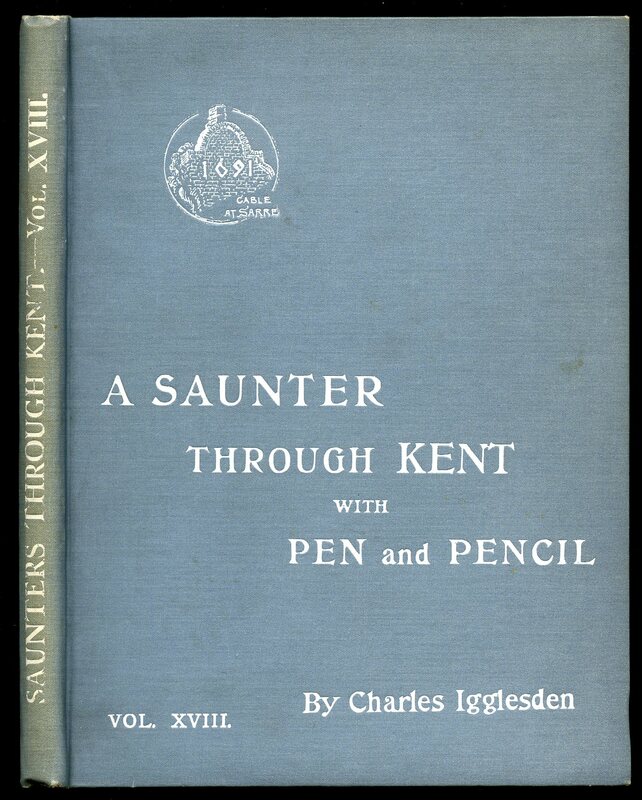 A Saunter Through Kent With Pen and Pencil Volume XVIII  Westbere, Grove Ferry, Reculver, Sarre, Ash, Woodnesborough. 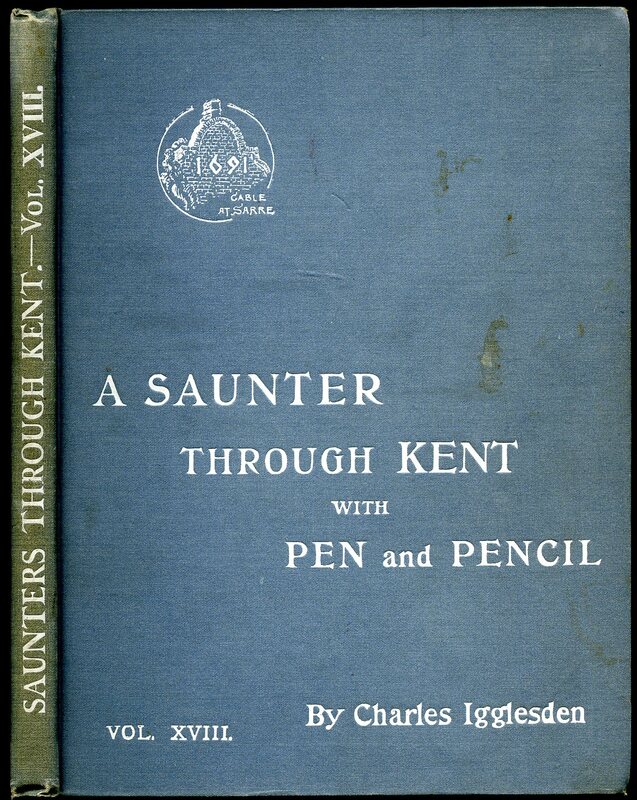 Published at the Offices of the Kentish Express, Ashford, Kent 1925. Ashford 1925. Hard back binding in publisher's original powder blue cloth covers, white title and author lettering to the spine and the upper panel. Quarto. 10'' x 7½''. Contains 81 [v] printed pages of text with tissue guarded monochrome illustrations throughout. A little brown spotting to the end papers, without any ownership markings, corners sharp and pointed and in Very Good clean and bright condition. Lists up to volume XXIX. We currently hold in stock 32 other titles by this author from this series. Member of the P.B.F.A. Published at the Offices of the Kentish Express, Ashford, Kent 1925. 1925. Hard back binding in publisher's original powder blue cloth covers, white title and author lettering to the spine and the upper panel. Quarto. 10'' x 7½''. Contains 81 [v] printed pages of text with tissue guarded monochrome illustrations throughout. Ink ownership name to the front free end paper couple of small marks to the covers and in Very Good condition. Lists up to volume XXIX. We currently hold in stock 32 other titles by this author from this series. Member of the P.B.F.A.